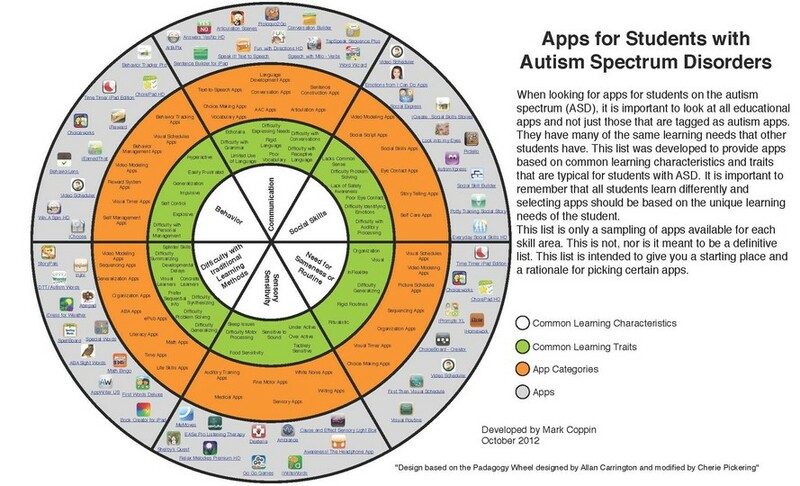 When looking for apps for kids on the autism spectrum (ASD), it is important to look at all educational apps and not just those that are tagged as autism apps. They have many of the same learning needs that other kids have. This list was developed to provide apps based on common learning characteristics and traits that are typical for kids with ASD. It is important to remember that all students learn differently and selecting apps should be based on the unique learning needs of the kids. This list is only a sampling of apps available for each skill area. This is not, nor is it meant to be a definitive list. This list is intended to give you a starting place and a rationale for picking certain apps. "Design based on the Padagogy Wheel designed by Allan Carrington and modified by Cherie Pickering"